Rinnō Ji is a complex of 15 Buddhist temple buildings in the city of Nikkō, Tochigi Prefecture, Japan. The site was established in the year 766 by the Buddhist monk, Shōdō. Due to its geographic isolation, deep in the mountains of Japan, the site soon attracted other Buddhist monks in search of solitude. Among the most famous buildings is the Sanbutsudō or Three Buddha Hall. This building features gold-leafed statues of Amida, Kannon with a thousand arms and Kannon with a horse's head. Next to the Sanbutsudō Hall there are Shōyō-en Garden and the Treasure House of Rinnō-ji. Another building, near the mausoleum, houses an unusual statue of Amida riding a large crane, which is an iconography rarely found in Japan. The temple also administers the Taiyū-in Reibyō, which is the mausoleum of Tokugawa Iemitsu, the third Tokugawa shogun. Together with Nikkō Tōshō-gū and Futarasan Shrine, it forms the Shrines and Temples of Nikkō UNESCO World Heritage Site. Here's the our members favorite photos of "Temples in Kanuma". 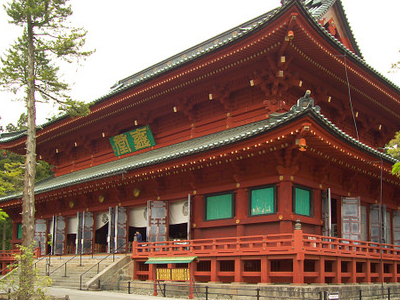 Upload your photo of Rinnō Ji!